Counter Height patio sets will let you have the best bay view, with a seat height that will provide a clear view above the deck railing. We offer a large collection of sets in modern to traditional styles available in aluminum, wrought iron, wicker and teak. 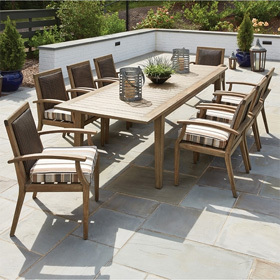 The seating and tables in these sets are designed to be taller than standard patio dining furniture, providing a casual atmosphere for meals and relaxing with guests. Counter-height tables are 34" - 38"H, while counter stools generally have seat heights ranging from 23" - 25". Popular styles include classic aluminum frame sets, casual plastic lumber sets and fire pit table sets. With sizes ranging from bistro sets that seat two people to large patio sets that accommodate six or more, there's an arrangement fit for every space.